NSC 207895 suppresses MDMX with IC50 of 2.5 μM, leading to enhanced p53 stabilization/activation and DNA damage, and also regulates MDM2, an E3 ligase. Median overall survival of mice (n = 5 mice in vehicle and PYR-41; n = 4 mice in NSC group) inoculated with IOWA-1T xenografts were increased to 43 ± 0.5 and 39 ± 2 days with PYR-41 (PYR) and NSC-207895 (NSC), respectively, compared with a vehicle-treated control group 33 ± 1 days (*p < 0.05). Nutlin-3a, the active enantiomer of Nutlin-3, inhibits the p53/MDM2 interaction with IC50 of 90 nM in a cell-free assay. Twenty-four hours after plating 1×105 Shh-EGFP cells, media was changed to serum-free media containing vehicle, 8µM Nutlin-3a, and/or Shh (3µg/mL). Cells were also transduced with lentivirus containing pLKO.1 empty vector or LentiORF-YFP-WIP1. 48 hours later, cells were fixed in 4% paraformaldehyde, permeabilized, incubated with α-WIP1 or α-Ki-67 antibody, and mounted using media containing DAPI. Scale bar, 100µm. RG7112 (RO5045337) is an orally bioavailable and selective p53-MDM2 inhibitor with HTRF IC50 of 18 nM. NVP-CGM097 is a highly potent and selective MDM2 inhibitor with Ki value of 1.3 nM for hMDM2 in TR-FRET assay. It binds to the p53 binding-site of the Mdm2 protein, disrupting the interaction between both proteins, leading to an activation of the p53 pathway. (C) SACi2 effects are dependent on MT-kinetochore attachments. The graph shows percentage of cells undergoing forced mitotic exit by SACi2 or DMSO in various pretreatment conditions (mean ± SEM, three independent assays). Nocodazole (Noc) was used at 70 nM and 3 μM, vinblastine (Vbl) at 1 μM, taxol (Tx) at 600 nM and monastrol (Mon) at 100 μM concentrations and were added 8 h before addition of DMSO or SACi2. MG132 (20 μM) was added 1 h before nocodazole. MX69 is a MDM2/XIAP inhibitor that binds to MDM2 RING protein with binding Kd values of 2.34 μM. It is used for cancer treatment. HDM201 is a novel, highly potent and selective inhibitor of the p53-Mdm2 interaction with affinity constant for Mdm2 in the picomolar range and a selectivity ratio greater than 10000-fold vs Mdm4. Idasanutlin (RG-7388) is a potent and selective p53-MDM2 inhibitor with IC50 of 6 nM showing improved in vitro binding as well as cellular potency/selectivity. 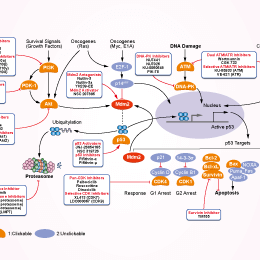 (-)-Parthenolide, an inhibitor of the Nuclear Factor-κB Pathway, specifically depletes HDAC1 protein without affecting other class I/II HDACs; Also promotes the ubiquitination of MDM2 and activates p53 cellular functions. Nutlin-3 is a potent and selective Mdm2 (RING finger-dependent ubiquitin protein ligase for itself and p53) antagonist with IC50 of 90 nM in a cell-free assay; stabilizes p73 in p53-deficient cells. Nutlin-3b is a p53/MDM2 antagonist or inhibitor with IC50 value of 13.6 μM, 150-fold less potent (+)-enantiomer of Nutlin-3 as in comparison with opposite (-)-enantiomer Nutlin-3a. Dissociative effect of Nutlin-3a, Nutlin-3b, and RO-5963 on the preformed p53·MDM2 complex. Representative electrophoresis polyacrylamide gels in nondenaturing conditions for the analysis of the dissociation power of the inhibitors tested. (A) The reaction mixture containing 25 M p53·MDM2 complex, treated in the absence (lane 3) or in the presence (lanes 4-14) of 0.040, 0.060, 0.080, 0.12, 0.33, 0.67, 1.33, 3.33, 6.67, 33.33, and 333.33 μM Nutlin-3a, respectively, were run on a 12% nondenaturing polyacrylamide gel. Thirty micromolar MDM2 and p53 was run alone in lanes 1 and 2, respectively. (B) As in (A), but using Nutlin-3b, at concentration of (lanes 4-14) of 1.33, 6.67, 13.33, 20.00, 66.67, 133.33, 266.67, 333.33, 400.00, 833.33, and 1666.67 μM. p53 and MDM2 (25 μM both) were run alone in lanes 1 and 2, respectively. (C) As in (A), but using RO-5963, at concentration of 0.10, 0.21, 0.42, 0.83, 1.67, 3.33, 8.33, 16.67, 33.33, 166.67, and 333.33 μM (lanes 4-14), respectively. (D) The percentage of the residual p53·MDM2 complex was reported in a semilogarithmic plot, at the corresponding concentration of Nutlin-3a (empty circles), RO-5963 (triangles), and Nutlin-3b (filled circles), respectively. (E) The percentage of MDM2 dissociated from the complex was reported as a function of the inhibitor concentration. Curve fitting was done using the hyperbolic function. Symbols as in (D). A panel of four NB cell lines were seeded in six-well plates with indicated concentrations of SAR405838 and agar, and grown for 2 to 3 weeks. Cells were stained with crystal violet for 4 hours. Colonies were counted and colony numbers were represented as % vehicle ± S.D. with P < 0.05 (*), P < 0.01 (**) or P < 0.001 (***) (Student's t-test, two-tailed) as indicated. YH239-EE, the ethyl ester of YH239, is a potent p53-MDM2 antagonist and an apoptosis inducer.